Palais Schönborn is a Baroque palace in the 8th district of Vienna, the Josefstadt. It is one of the very few surviving palaces of its kind in this specific district (although there are plenty of others in other districts - for an introduction, please see my article on the "Palais of Vienna"). Palais Schönborn is home to the Museum für Volkskunde and a rather battered building; as of 2008, an argument on whom is responsible for the renovation and maintenance between the society that runs the museum and the city of Vienna is not decided. This makes Palais Schönborn one of the most charming Palais of its genre in Vienna - at least to me the disintegrating façade adds greatly to the appeal of the palace. A member of the Schönborn family (old Austrian-Hungarian nobility) is the current cardinal of Vienna, by the way. A few words on the history of the Palais: In 1706, the Count Friedrich Carl von Schöborn-Buchheim was made "Reichsvikar" (a high rank in Austrian clergy back then) in Vienna. Schönborn was to become Prince Bishop of Banberg and Würzburg later in his life. Upon moving to Vienna, he hired Lukas von Hildebrandt - architectural super-star of the Baroque age - to design himself a fancy little garden palace to be built in a suburb. Schönborn bought a piece of land in the Alservorstadt suburb, the Palais was completed in 1714. The Reichsvikar Schönborn moved in and soon, the palais was famous for the art collection it housed, the interiors as well as the landlord′s extravagant tulip culture. In 1725, Schönborn purchased surrounding land and extended his garden. It was essentially made a formal park with a grotto and various Baroque follies. When Count Schönborn-Buchheim died in 1746, the interiors and the art collection - which included a famous Rembrandt - were taken to the family′s city palais or sold. After 1750, the Palais Schönborn was let to various aristocrats, including the court architect Canevale. In 1841, Baroness Amalia Pasqualati founded a school for acting and a small theatre in the Palais Schönborn. Throughout the early 19th century, when the 8th district developed rapidly and land increased in value - parts of the parks were sold and houses were built around the palais. In 1862, Palais Schönborn was sold to the city of Vienna. It was renovated and the remaining gardens were opened as a public park. 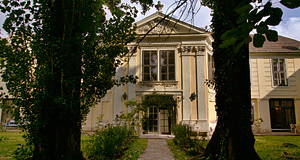 In 1872, Palais Schönborn became home to the newly founded Universität für Bodenkultur (BOKU), which now lives in the district of Währing. The BOKU moved there in 1897; after that, Palais Schönborn was used as a court house. After 1917, Palais Schönborn became home to the Museum für Volkskunde. The collection is not dedicated to Austrian folk art, but has an international scope. Nevertheless, the significance of the museum is not that big. The Schönbornpark is tiny and not terribly attractive - yet the biggest piece of green in the entire district. Attractions nearby include the Bezirksmuseum, mostly dedicated to Gustav Klimt and his workshop (which was situated in the Josefstadt); the Theater in der Josefstadt; the Palais Trautson and Palais Auersperg as well as the Justizpalast; the Piaristenkirche; and the Rathaus City Hall.